This is one of kind Ganesh Utsav Mandal in the whole of Karnataka which is run by Women. 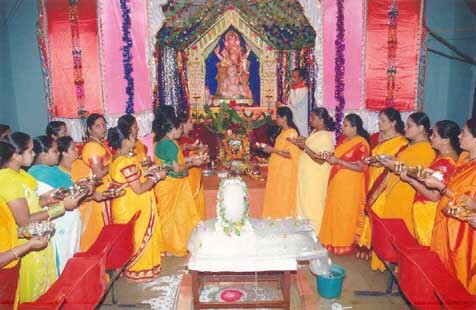 These women came together 6 years ago and started to celebrate Ganesh utsav on a public basis like other Sarvajanik mandals. These women residing at Rani chennamma Nagar second stage came together to celebrate the elephant God’s festival from 2004. All the women start the preparation of the festival 8 to 10 days ago, make arrangements for decoration and collect the donation from going house to house as well. All the people of the area have encouraged them. Various competitions for children and elders are organized during the festival time like dance competitions, drawing and singing competitions.